Is the Democrats’ “Separated Children” Ploy Working? In a remarkable show of unity, the liberal press launched a coordinated effort to distract voters’ attention from the booming economy, President Trump’s summit with North Korea’s Kim, the DOJ Inspector General’s report and the collapse of the Mueller investigation with a ginned-up controversy over temporary separation of illegal immigrant children from their parents at the southern border. Otherwise known as law enforcement. On a short-term basis, the ploy has had some success. President Trump’s job approval rating has dropped to 46% in the most recent Rasmussen daily tracking poll, and news about the economy, etc., has been taken off the front pages, to the Left’s relief. But there is good reason to believe, I think, that these successes are only temporary. First of all, Trump’s approval rating hasn’t taken much of a hit, given the coordinated and deliberate media effort. Assuming it doesn’t drop further, 46% is toward the low end of Trump’s recent range, but hardly a catastrophic decline. And there is zero evidence that the faux controversy has impressed Trump’s electoral base, as his triumphant visit to Duluth last week, to name just one example, illustrates. 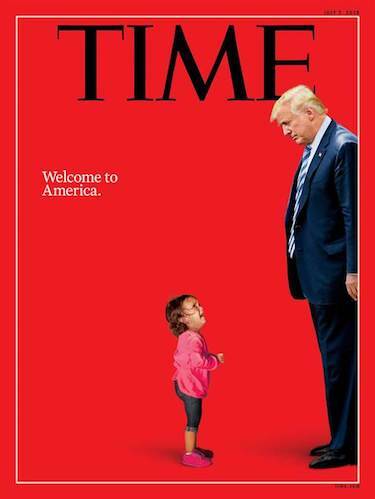 Time has acknowledged that the photo is misleading and that the girl was not in fact separated from anyone, but nevertheless stands by its cover, which it considers to be fake but accurate. Worse than the Left’s lies and distortions are its fascist tactics. A gang of socialists confronted Homeland Security Secretary Kirstjen Nielsen in a Washington restaurant and hounded her out the door. Even worse, another gang of Brownshirts descended on Nielsen’s house in a “protest.” They shouted slogans and played loud recordings of children crying. I’ll bet the neighbors loved that. People hate these despicable tactics, and they will rebound against the Democratic Party. Second, the ultimate effect of the “separated children” flap is to focus attention on the immigration issue in general, and the flood of illegals crossing our Southern border in particular. The problem for the Democrats is that they lose this issue. Voters realize that the bottom line is, Democrats favor lots of illegal immigration, while Republicans oppose it. The GOP wins this one every time. 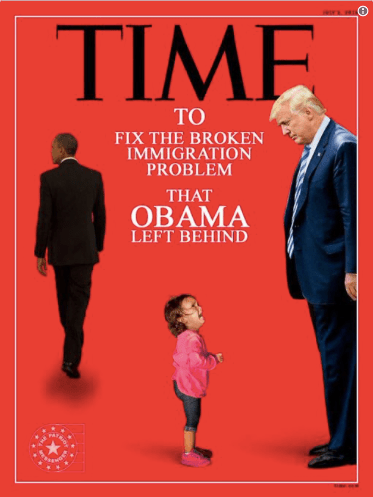 In a mere year and a half, the Democrats seem to have forgotten that Donald Trump is president largely because of his stance on illegal immigration. So, annoying as the “separated children” would-be crisis is, conservatives shouldn’t panic. Its long-term effects will be neutral in the worst case, and more likely positive for conservatives and Republicans who stay the course.